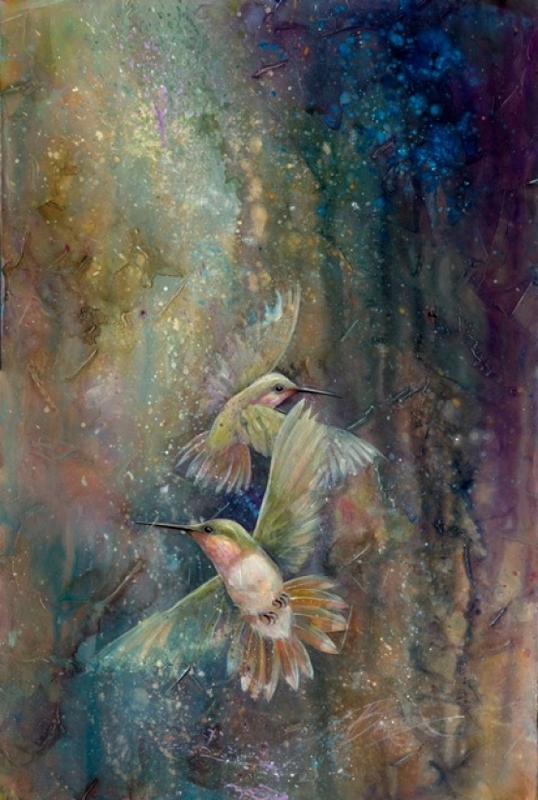 Happy Mothers Day... and 3 New NW Paintings For You! Mothers Day is a time to honor the person most essential to our lives...our Mothers. I am so grateful for all Mothers and the tender care they give, lack of sleep, countless meals, loads of never ending laundry and hugs. What an important person for all of us. I hope your Mothers Day is Special! Same with Mugs...Buy 24 and get one free! This is a memory collage of the islands. 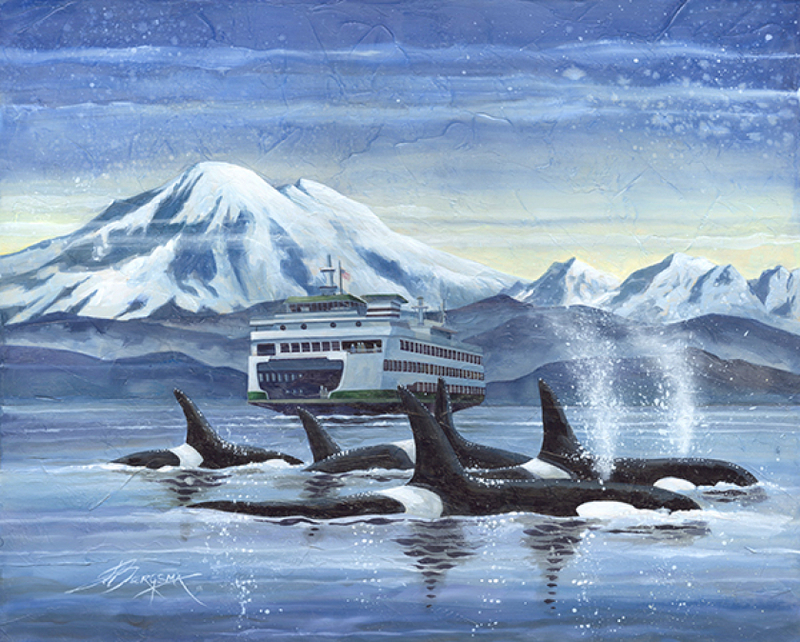 Traveling by ferry, glimpsing the Orce Whales and the stunning views of the mountains was something I wanted to capture in this painting. I researched the ferries and decided to honor the Elwah (Built in 1967 and named after the Elwah River). Lots of photos later I had the perfect view. Getting the perspective right in the drawing phase is the most important thing. 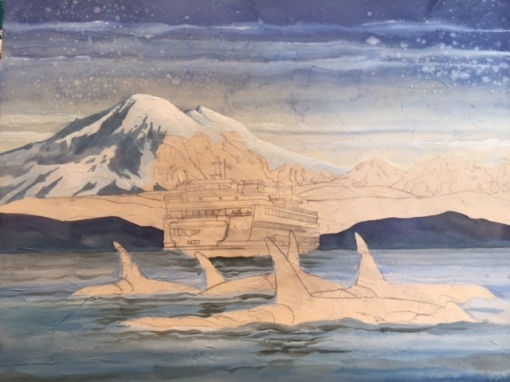 I painted the whales in the foreground last. I do the darkest colors on top of the light ones to create sharp lines. 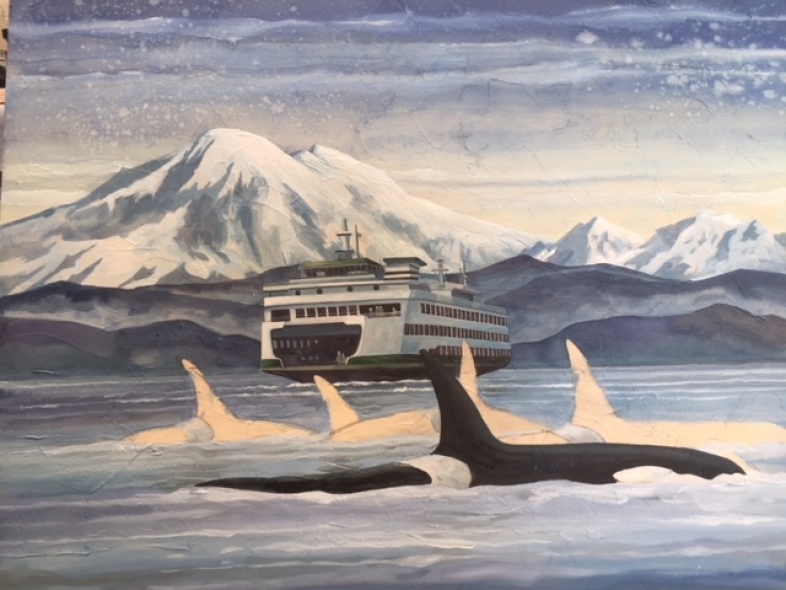 Whales are a rare sight in the San Juans. 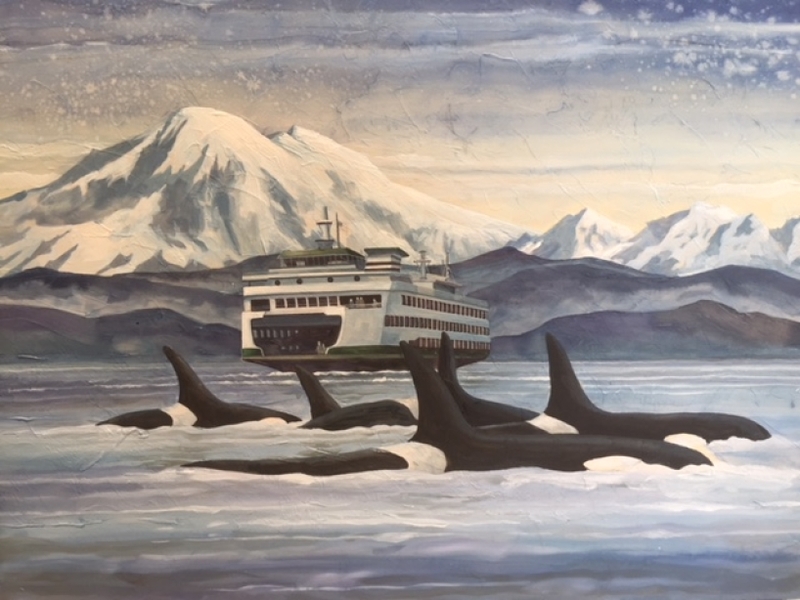 Here is a link to more information about the San Juan Orcas...Link. Once the colors are blocked in it is time to give more action to the waves and the tremendous spray that they create when they exhale. The pallet is mostly blue. 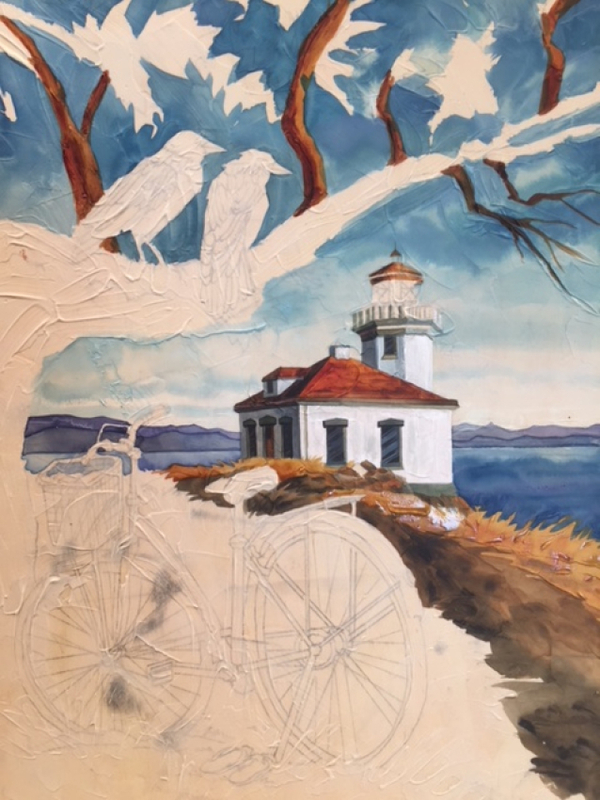 to create the NW gray shades I add a neutral sepia brown and burnt sienna. I add naples yellow to the horizon for warmth. 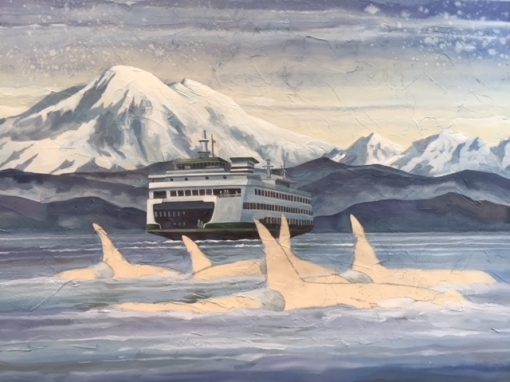 "Traveling the Islands" is an image that captures the majesty of the N.W. For more information about this painting and products that go with it please respond to this email. "Enjoy the Ride" is focused on the wonderful time you can have riding a bike through the islands and along the coast. This is the famous light house on San Juan Island called Lime Kiln Light. 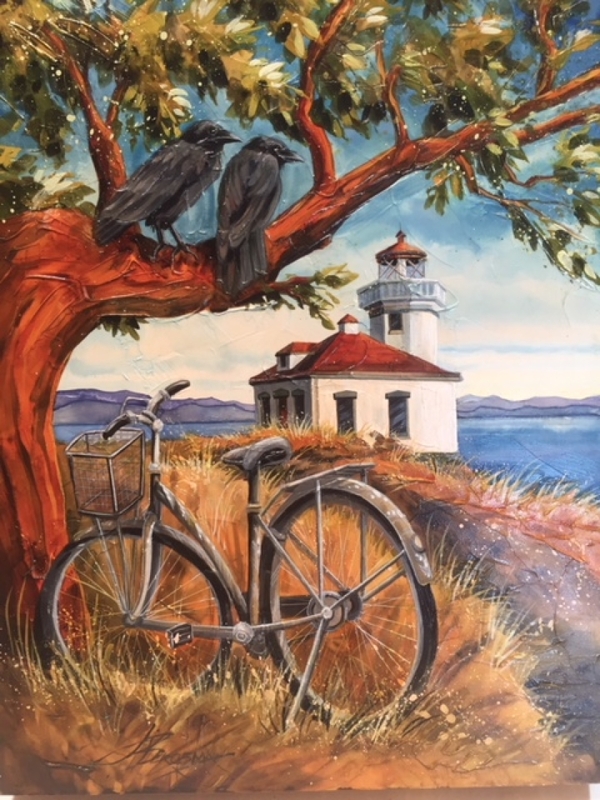 The Lime Kiln Light is a functioning navigational aid located on Lime Kiln Point overlooking Dead Man's Bay on the western side of San Juan Island, It guides ships through the Haro Straits and is part of Lime Kiln Point State Park, which offers tours during summer months. Built‎: ‎1917-1919Height‎: ‎38 feet (12 m) Original lens‎: ‎Fourth order Fresnel lens. 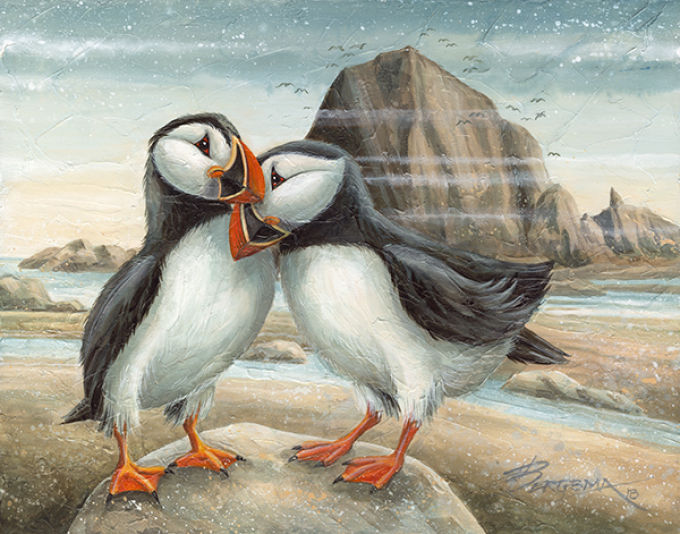 "All We Need is Love" celebrates the Oregon Coast where puffins roost and raise their young. One more reminder of the importance of Moms this time of year. Wishing everyone a wonderful May and a very Happy Mothers Day.